March is Women’s History Month. This year’s theme is “Visionary Women: Champions of Peace and Nonviolence.” Castleton has lots of events honoring women and women’s history during the month. The image above is from the American Women’s History Initiative of the Smithsonian Institution. The Her Story project’s purpose is to “amplify women’s voices to honor the past, inform the present and inspire the future. 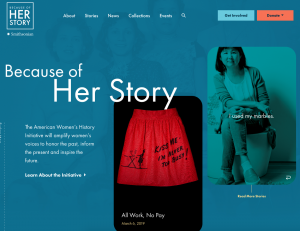 The stories we tell deepen our understanding of women’s contributions to America and the world, showing how far women have advanced and how we as a country value equality and the contributions of all our citizens.” Take a look to learn more. There are lots of ways to learn more and honor the contributions of women! Your always friendly and helpful librarians have compiled resources for researching summer job and internship opportunities. Find opportunities to make money, gain valuable experience, travel, have adventures, and explore careers. Includes links to opportunities in Vermont, other states and around the world. 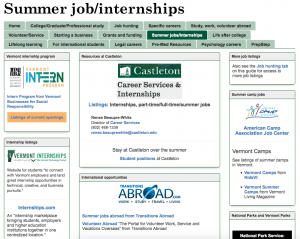 Find paid internships, jobs in summer camps, jobs in “cool places” and more. Your library is always looking for ways to help students learn, grow and meet their goals!